I am waaaay behind on my baking projects, including the Big XII. I am still trying to get caught up! Here's part of the reason: the few spare minutes I had last weekend went to making some fun Halloween food! 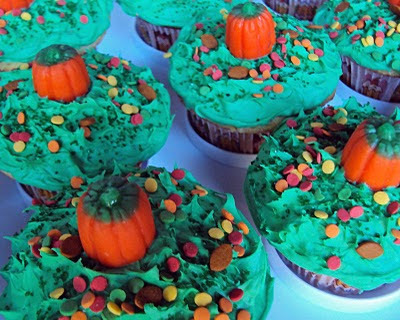 I made these "fall harvest" cupcakes, totally last minute, for a Halloween party we went to. I had no idea what I was going to do, especially since all the ones in my cupcake books required alot of supplies that I didn't have and didn't have time to go out and get. So I did a little survey of what I did have, and came up with these! I also made these for the boys, the night before Halloween. They're from one of my Halloween foodie mags! Cute! I don't think I have any pics of our actual Halloween dinner, but I made hot dog mummies....very cute!